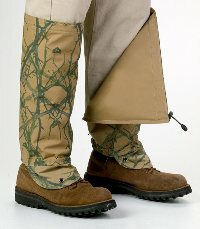 TurtleSkin SnakeArmor's reversible snake protection gaiters are designed so that you can wear either the natural camo pattern or reverse it to the lighter khaki side. 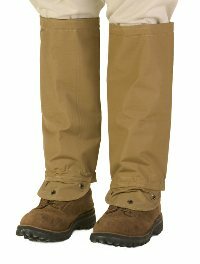 Constructed from a blend of high-strength ballistic fibers and polyester in a super-tight weave, SnakeArmor gaiters are also windproof, waterproof, and flexible. Simply close up the back and cinch the elastic top for a snug fit. Available in two sizes. Regular Size: 20" Top of Calf, 17" Ankle, 16" Length. A pair weighs a mere 11 ounces! Husky Size (for larger calves and ankles): 23" Top of Calf, 20" Ankle, 16" Length. A pair weighs a mere 13 ounces!